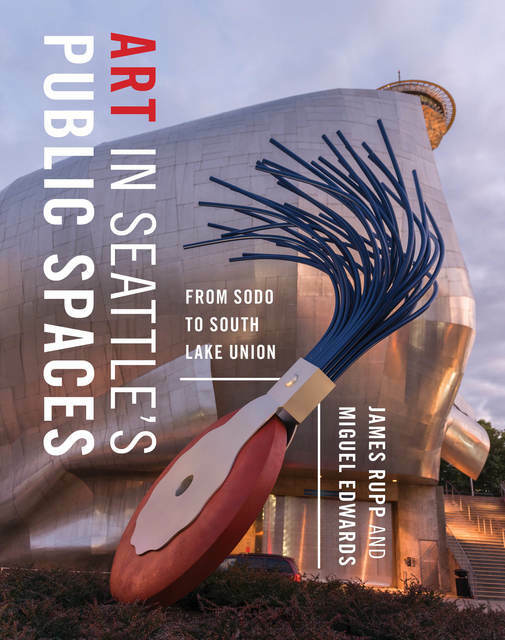 This chapter from Art in Seattle's Public Spaces highlights public art in and around the Washington State Convention Center. Click on "University Street to Stewart Street" below to begin your art walk. From cedar totem poles to high-tech video installations, downtown Seattle sparkles with hundreds of artworks adorning plazas, lobbies, parks, and waterfront piers and paths. This impressive collection has expanded rapidly as Seattle's urban core has grown. To tell the lively stories of those who commissioned and created these artworks, James Rupp interviewed more than ninety artists, also drawing from newspaper reviews, books, catalogs, and artist statements. Photographs by Miguel Edwards showcase the pieces' street-level presentation and help the reader understand the larger impact of each work in its neighborhood context. This comprehensive guide offers detailed information about the individual works of art, organized by downtown neighborhood. Perfect for art and architecture lovers, as well as visitors and newcomers to the city, Art in Seattle's Public Spaces showcases the wealth of urban art to be freely enjoyed by all. University of Washington Press. Photographs: Miguel Edwards.